What Can You Do With Your Flat Panel Display? Today’s students are digital natives, so it makes sense to incorporate displays into the learning process. But what’s the best way to use this technology? You want to make sure your students are learning as much as possible, but you also want to keep things fun so they won’t get bored! In late 2015, the Woodhaven-Brownstown School District in Michigan passed a bond of almost $55 million for building renovations. While the bond was primarily for its secondary school, the district decided to include Yake Elementary, which for years had been without the funds to update classroom technology. Yake’s media specialist, Joe Heacox, was part of the team that evaluated potential purchases. The technology they decided on was Boxlight’s ProColor 75” interactive flat panel displays. The team determined, and school leaders agreed, that the displays’ cost and longevity made them the best choice. Whole-class learning is a key aspect of the modern classroom, but how do you find the right solution for your school? There are a variety of options, so you need to take a closer look at each one to determine which is the best choice for your students, teachers, curriculum, and budget. The search for the new interactive classroom technology can be incredibly daunting. How do you know what’s right for your school? How do you differentiate between the various solutions available? Will it be simple for both teachers and students to use? And how do you find the best solution to fit your budget? The schools in Kildeer Countryside School District 96 had already been recognized for their academic excellence by the US DOE and the Illinois State Board of Education. Still, district administrators recognized that significant changes needed to be made to our classrooms, and better technology needed to be acquired, in order to help our students acquire the new skills mandated by today’s educational standards: effective communication and collaboration. So, we focused our attention to revamping classrooms to fit the learning needs of 21st century students, and we turned to our most trusted partners to get the job done. Working closely with these partners made all the difference in our successful implementation. Following are the lessons we learned along the way in terms of products and partnerships, which are inextricably connected. You’ve examined all the requirements: room size, HD vs UHD, the size of the interactive area you need for the number of students you want to have working together, and the display with the best classroom software. Then you come to the final factor: budget! Budget is often not a small factor, especially when you need to outfit 10, 20, or even 100 classrooms. Sometimes the answer to your display requirements and needs is an interactive projector. Large flat panel displays fill an increasing number of living rooms with dazzling images that bring the theatre experience into the home. Many of today’s students are accustomed to high definition (HD) – for them it has become the expected standard. As educators and schools strive to find ways to better engage students and motivate learning, they are recognizing that using interactive HD technology in the classroom could be one way to achieve this. But the search for the best choice of interactive flat panel display – one that offers stunning images, touch technology, and seamless integration – can be daunting. 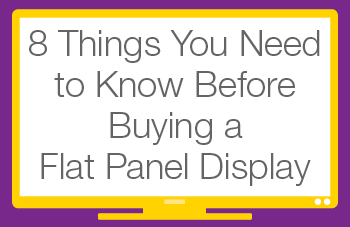 We have pulled together eight things you need to know to determine whether a flat panel display is the right choice for your classrooms. Large flat panel displays fill an increasing number of living rooms with dazzling images, and the theater experience is becoming a daily experience at home. Many of today’s students are accustomed to high definition – for them it has become the expected standard. As educators and schools strive to find ways to better engage students and motivate learning, they are recognizing that using interactive HD technology in the classroom is key. In these tips we highlight the top five things to think about when making this purchase.